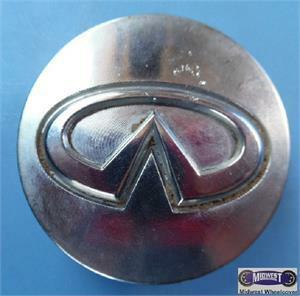 73646, CENTER CAP USED, 97-98 INFINITI Q45, MACHINED FINISH WITH LOGO IN CENTER. 3 GROUPS OF 3 PLASTIC CLIPS. & WIRE RING. 2" DIA.